With a brand new album to show off, Kimbra created an experience of live-produced music, visuals and dancing for the all-ages crowd at Delmar Hall on May 30. With her musical roots in New Zealand and Australia, it's taken many years for Kimbra to reach our fair Midwestern city on tour, but with a third major release on hand, the singer-producer has rapidly visited for the second time in just over one month's time. After supporting Odesza at the Pageant in late April, the crowds at Delmar Hall were treated to her first headlining set. 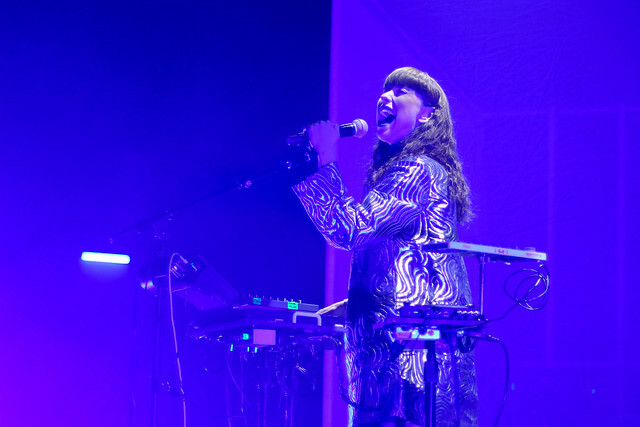 Named for the new LP, the Primal Heart Tour featured a deep exhibition of Kimbra's new music, presented with live production and an active visual experience. After much anticipation, the experience of a Kimbra concert had finally come to St. Louis. From first arrival, the stage set-up piqued the curiosity of the more observant fans, decorated with two large white structures that gave the illusion of complete cubes, wrapped in a white, translucent covering that teased the audience like a sultry negligee, concealing two sets of barely visible instruments. At the center of the stage, another arrangement was covered in black. It may have been unclear how everything would look when the lights came on, but it was already certain that this would not be a night of prerecorded production; the show was going to be full of on-site music creation. After an ample break between acts, a deep electric tone and sudden change to the stage lights quickly wrangled the crowd to a near-hypnotic attention. Timon Martin and Spencer Zahn ghostly appeared through the onstage structures, each occupying his own cube and creating the backing production from an arrangement of guitars, basses, synthesizers, drum pads and keyboards. The opening piece, “Version of Me,” selected from the newly released album, featured a relatively simple musical backing that primed the audience for the first note from the star vocalist. Beginning offstage, Kimbra entered while demonstrating the finesse and control she can achieve with simply her voice and a microphone before approaching the her own array of toys at the front of the stage. The majority of the set was largely from “Primal Heart,” giving the New Zealander ample opportunities to perform many of her newest songs, each ripe with her active touch on both the production and the vocals. From her station at center stage, she was able to launch, augment and mix her arrangements on the spot, leading the band who joined in from their obscured positions on stage. Even though the set-up tethered her to the front of the stage at times, Kimbra was actively dancing, posing and repositioning the jacket that covered her outfit beneath. However, she was far from anchored to her station throughout the whole night, using every opportunity to break free and go dancing across the stage in a distinctively unchoreographed style. With projections of flowing imagery beaming at the front of the cubes and selectively used LED bars shining through from the rear, the visual experience kept pace with the electric energy of the music. There was never a dull moment as the selections were mindful to keep the energy up, often embracing the lively electric style of the new material throughout and when given the opportunity, Kimbra would never fail to let her vocal skills shine. At the close of the set, there was little doubt that an encore would be in-demand and the star happily obliged. The night closed with a final, unexpected trick as the star reemerged solo, adding a loop station to her set-up to revisit the performance style of her early career. While enjoying her newest musical advancements, Kimbra celebrated the roots of her career and the musicianship that continues to distinguish her from many of her contemporaries. Kimbra performing at Delmar Hall, May 30, 2018. Photos by Karl Beck. Head over to our Flickr page to see the full set of shots from the evening.